BCDB Rating: "Kaena, Le Prophétie" has not yet received enough votes to be rated. This page has been viewed 24 times this month, and 1781 times total. Cartoon Characters: Kaena, Opaz, La Reine, Le Prêtr. English Cast: Opaz, Kaena, Queen of the Selenites, Bobby, Voxem, Assad, Gommy, Zehos, Essy, Ilpo, The Priest, Enode, Kamou, Roya, Sambo, Reya, Demok. Voice Actors: Cécile de France, Michael Lonsdale, Victoria Abril, Jean Piat. Directed By Chris Delaporte, Pascal Pinon. Written By Chris Delaporte, Tarik Hamdine. Originally Released in Oct, 2003 (Estimate). France's first 3D CGI feature. 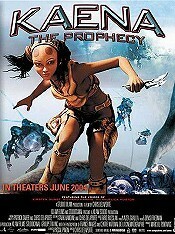 U.S. release date: June 2004. Do you have anything to add to this page? Have we made any mistakes... or do you have any additional information about Kaena, Le Prophétie? If so, we would love to hear from you. Please send us a quick note with your additions or corrections to this page, and we will make the corrections as soon as possible! 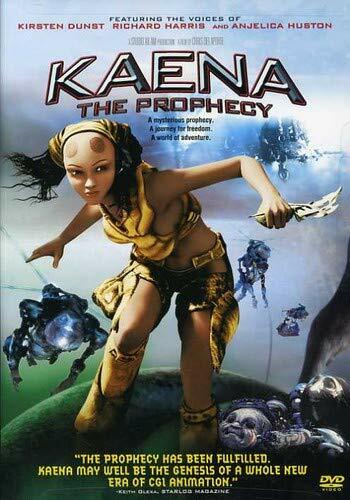 Do you love Kaena, Le Prophétie, or do you think it is the worst cartoon ever? Let us know what you think! Surely you have an opinion... so share what you think. Take a minute and post your own comments about this cartoon here. Kaena, Le Prophétie by Big Cartoon DataBase is licensed under a Creative Commons Attribution-NonCommercial-ShareAlike 4.0 International License.